James Meyler: is the first practitioner to introduce the Neurolink approach to Ireland and the first Irish Practitioner to study the Masters Course in NIS Neurolink. He has been studying with Dr. Phillips since 2002. 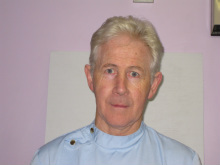 He is also a UK BUPA Registered Osteopath for 30 years practicing in Omagh, Co. Tyrone, N. Ireland. His clinic is now primarily involved in the diagnosis and treatment of a wide variety of ailments that are not responding well from other therapies. Clare Meyler: Qualified Aromatherapist and Reflexologist, has been working in the clinic for the last 22 years. Brenda Meenagh: Secretary and Receptionist in the clinic for 27 years.